This was how the Brazilian Band greeted the around 500 guests in Latina Restaurant on Saturday 20.03.2010 for the Brazilian Carnival in Shanghai. It showed the international carnival crowd another tradition of Brazilian life and culture. 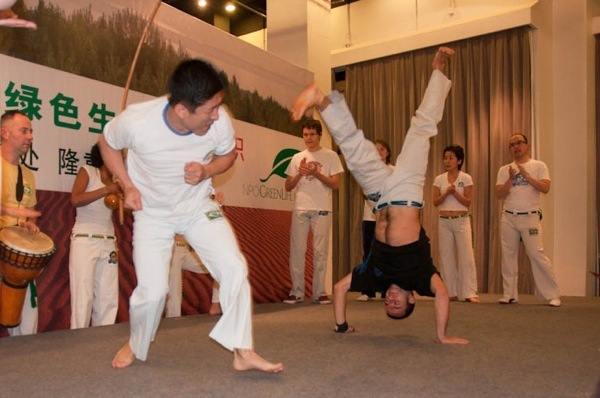 Amidst all these traditional elements and presentations, there is certainly one cultural aspect which should not be omitted, and that is CAPOEIRA – the cultural heritage of Brazil, a sport which shows a great deal of Brazilian culture and history, a mixture of martial art, dance and music. 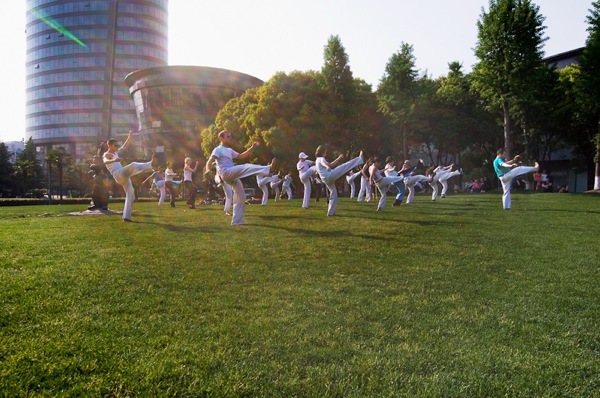 The performance was presented by Grupo Capoeira Mandinga, the only capoeira group in Shanghai. The space was limited, the “roda (playing circle)” small and tight, but with the berimbau (traditional one-string music instrument) leading the rhythm and songs for 20 capoeiristas, and a cheering international crowd, the atmosphere was energetic and it was the perfect time to show this beautiful Brazilian art form. 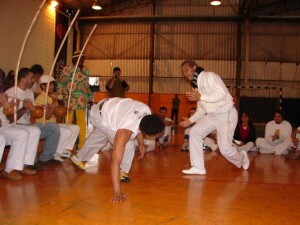 The capoeiristas played and showed all the art’s acrobatic “movimentos”, beautiful “golpes” and rhythmic “gingas”. The mixtures make the beauty of the game, and so it was exciting to see the different styles of the capoeiristas. Some impressed the crowd with radical acrobatic maneuvers, some played a smooth and stylish slow game, and some performed with many kicks and fighting movements, always controlled in order not to harm the opponent but forcing him/her to defend or launch a counterattack. The show lasted for about 15 minutes and impressed upon everyone just how much this Brazilian cultural heritage has spread all over the world – even to Shanghai. On the 18th of March 2010, after years of managing their activities from their home, the non-profit-organisation for environmental protection Greenlife NPO celebrated the opening ceremony of their new office in Luwan District, Shanghai. Capoeira Mandinga Shanghai took part in the set of performances to entertain the guests, which included Chinese traditional dancing, contemporary dancing, a comedian show, and a couple of music performances. Over ten capoeristas displayed their kicking, singing and percussion abilities for a crowd of more than 250 people. Most of the audience −mainly Chinese and Japanese− wasn’t familiar with the art, but after a couple of minutes of uncertainty on their faces, they soon grasped the fun of the game and the rhythm of the music, then the clapping and cheering spread in the hall. The climax of the show came when Guerreiro went upside down in a solid bananera, that provoked a wave of excited gasping. The acrobatic position and his upper body −lush with masculinity and suddenly unveiled by the fall of his T-shirt− were equally compelling. Sushi delighted us with a flash come back from Japan appearing just before the show to treat us with his neat technique. The audience didn’t notice, but Pombinha could not overlook his change in shape since he left the group. 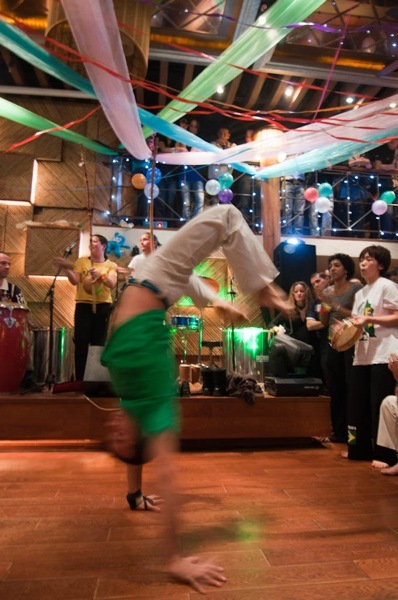 Capoeira show: Brazilian Carnival at Latina next Saturday 20 of March! Next Saturday 20th of March there will be a Brazilian Carnival Party at Latina in Xujiahui, with live music, samba, caipirinha. They have asked us to do a capoeira presentation there! 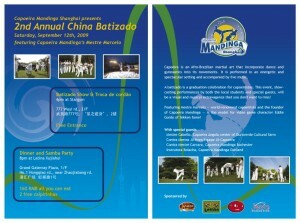 So EVERYONE is invited to come to give energy and to play capoeira. The party starts at 22:00 (Free entrance). We can go there earlier for dinner (they can give us a discount on the buffet). Please let me know if you can come for dinner, or just for the show. I need to inform the organizer. 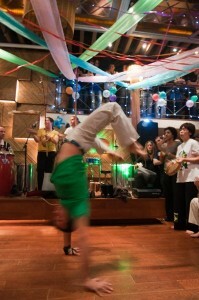 We are trying to get together a possible Capoeira performance next week, on Thursday the 18th. The whole event will run between 17:00 and 20:00 but we would perform after 7, probably around 19:15 (flexible time). We would like to know who could make it. Please answer as soon as you can if you can make it and at what time, so I can give a definite proposal to the organiser. The show would be within an event organised by Greenlife NPO – an ecologist NGO (www.npo-greenlife.org) to celebrate the opening of their new office and to put some art donations for sale. The task of Greenlife NPO is fighting desertification and its consequences in China. During the last 6 years they have already planted more than half a million trees in the Hure banner, in Tongliao Prefecture in Inner Mongolia. This year they expect to raise the number up to more than one million trees and complete the project. After that, they will move to other areas suffering severe desertification in Sichuan and Yunnan. The personal story of the founder of the NPO is quite exceptional, I recommend you to check out the web page and find out. Expect around 20 min. walk from the metro stations. Entering the compound from Luwan Road on your right there is the office, and the following building is a big hall they will use for that event. 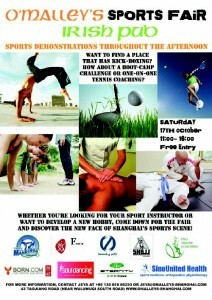 Just to remind everyone that this Saturday (17th of October) we are participating at the Sport Fair at O’Malley. It’s from 11am to 4pm, we need a couple of people to be there at 11:00am. 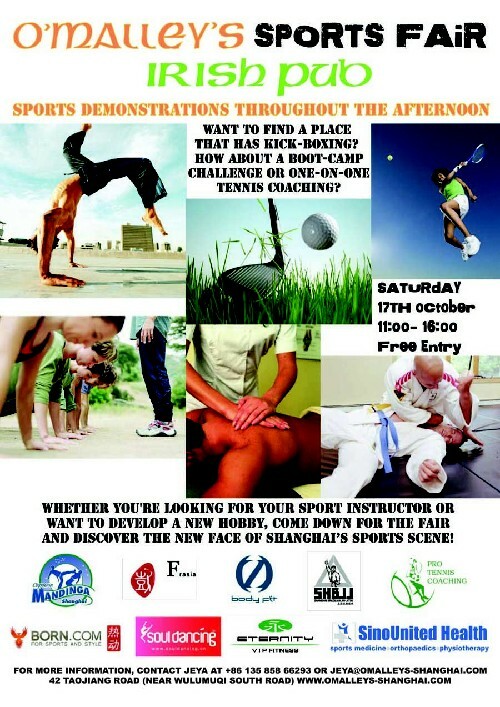 At 3:00pm there will be a capoeira roda so everyone should try to be there on time ok? After we will move to our gym for regular class. An Event with some of the Greatest capoeira teachers in the world (mestres/contra-mestres Brasilia, Cabello, Kibe and others). In the middle of Ubatuba paradize (Brazilian Hawaii) in colaboration with a music and dance camp with some of the most famous musitians (Hermeto Pascoal, Jovino dos Santos, Jorge Alabê and others). This will be a combination of permaculture learning and practice event where students will have the opportunity to practice environmentally correct building and living situations in the middle of a training facility built in the jungle of Ubatuba. Walking distance to beautiful waterfall, river and beaches. Note: Space for this event is limited. Sign up ASAP.